TacTic, a system of golf swing training aids widely used by PGA and LPGA instructors through out the major golf schools around the world. It has been written and said by all the great teachers and players that the 'moment of truth' in golf is at 'impact'. Great players all look slightly different from each other, when they swing the club, but at impact they look incredibly similar to one another. At Impact, their lead wrist is flat, allowing them to deliver the clubhead squarely and powerfully with a great deal of cinsistency. Impact is where better players and less accomplished players can look very different from each other. Often less accomplished players break down at impact, cupping their lead wrist, losing power early and decreasing their accuracy. 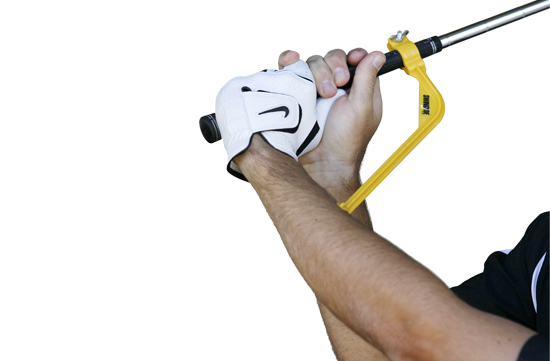 When a player releases the club properly through impact while wearing the WRIST TacTic, there is no "click". The TacTic "clicks" when a player breaks down, by cupping their lead wrist at impact. The greatest advantage in using the WRIST TacTic is its application is not limited to impact during the full swing, but also can be used while practicing putting, chipping and pitching. The elbow TacTic was designed to give the same type of feedback to a player who breaks down at the elbow. When you watch the more powerful and consistent players on tour, it is evident that they keep their lead arm fully extended during the backswing and throughout the impact position. Simply put, the wider the arc of the arm swing, the more power generated through the clubhead. Many players have tried to keep their lead arm extended during their swing, but fail because they cannot feel the arc, unaware of a break down at the elbow. When a player swings with the ELBOW TacTic on the lead arm, they are made aware of a break down in the elbow by the sound of a "click". By practicing with the ELBOW TacTic, a player is given the feedback necessary to help them keep their lead arm extended. Another very useful application of the ELBOW TacTic is to use it on the right arm. Many players misunderstand the proper position of the right arm throughout the golf swing. Many golfers actually try to keep their right arm close to the body during the backswing, norrowing their swing arc and, limiting their power, distance and accuracy. The right arm should extend away from the body, beginning the bend midway back then reaching a right angle at the top of the backswing. With the ELBOW TacTic on the right arm, a player should hear the click just after the midway back point, reaching the top of the backswing. The ELBOW TacTic used on either arm will educate a player as to what an extended arm feels like thus enabling the player to achieve a more powerful and consistent golf swing. The ANKLE TacTic was designed to give the same feedback to a player who sways the lower body like a tennis player and breaks down the right ankle. The ANKLE TacTic "clicks" when the ankle bends. 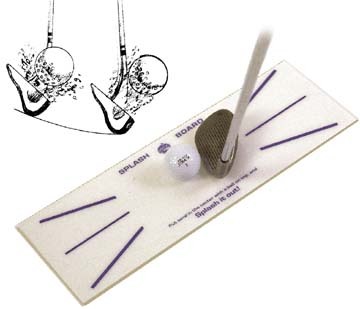 This will cause the player to loose power from the coil and slice the ball. 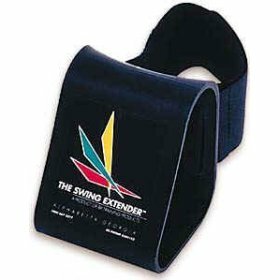 If one were to ask America's top 100 golf instructors what would be the most common swing error they would undoubtedly say the all too common reverse weight shift. A reverse weight shift is the result of an unstable foundation. Visualise a person chopping down a tree. They would cut the tree on the side in which they wanted it to fall. The tree will always fall to the side in which it is cut. Liken that to a golfer. If a players right (back) leg does not remain flexed, his weight falls towards the left (forward). The resulting 'tree falling' motion is a reversw weight shift. During a golf swing, the right knee becomes the pivot point for the backswig and launching pad for the downswing. When the right knee stayes in a flexed position during the backswing, a player can coil their weight into their back leg. thus storing energy for the downswing. While using the KNEE TacTic on their right knee, a player will hear a "click" when they do not maintain a flexed knee position. The KNEE TacTic will allow a player to self correct the problem and will help them to avoid a reverse weight shift. The final result will be a solid foundation for a powerful golf swing.